My Thoughts: This is a steampunk story with friendship and lots of girl power. Cora is a lab assistant to inventory Lord White who found her in a poor part of town and educated and trained her. Nellie is a magician's assistant who was discovered when she was a child doing burlesque. Michiko is was in training to become a samurai when she encountered her current employer and finds herself in London giving fighting lessons. The story begins by introducing the three girls and their mentors before it introduces the mystery. Each girl has part of the story and it isn't until they all meet that they get a better picture of what is going on. I liked that each girl has a unique personality and a unique relationship with their mentors. I likes the steampunk gadgets that Cora and the villains of the story invent. 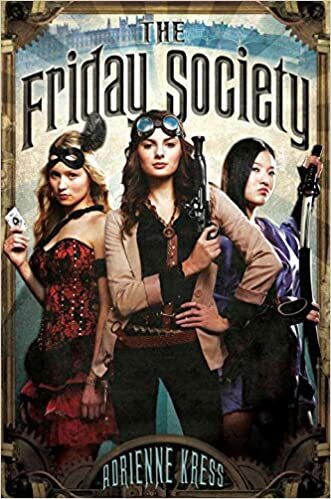 I liked the friendship that grew between the girls as they teamed up, each with their own particular skill set, to solve murders and find out who was blackmailing London. There were lots of interesting situations and the villains were way over-the-top from the scientist who was collecting body parts and had a special interest in eyes to the grave robbers who supplied him with bodies. "It's a very long story." Which clearly wasn't a good enough excuse for him. And so...she told him everything. That she could think to make up in the moment. I bought this one in 2012. You can buy your copy here.